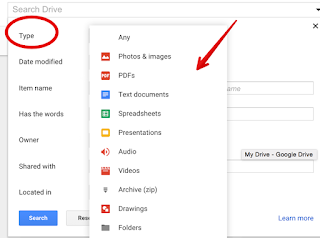 Most of us in education use Google Drive as a repository where we save files we use in our daily work. Depending on how often you use it, the accumulated amount of files hosted in your Drive can be overwhelming and searching Drive for a specific file can be a real challenging task. Thankfully, Google Drive has introduced a number of powerful search features to facilitate your search. In today’s post, we are sharing with you 5 interesting search tips to help you conduct smart, efficient and time saving search queries in your Drive. 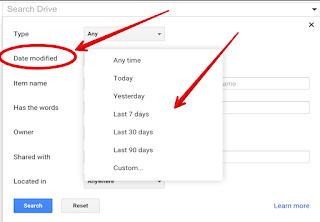 To access any of the features below, open Google Drive in your computer and click on the advanced search settings button on the right hand side of the search box. To search for a specific file type, change the value in front of Type from 'Any' to any other type you want. You can, for instance, conduct a Drive search for audio files by choosing ‘Audio’. Likewise you can search for PDFs, Images, presentations, spreadsheets, text documents, and drawings by choosing their corresponding values from the list. This hack enables you to narrow down your search query to include only files that have been modified in a particular period of time. For instance, you can search for files that were modified yesterday, last week/month…etc. 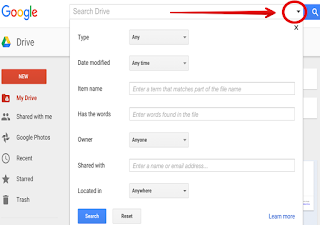 If you are not sure what the exact name of your Drive file, you can type in a term that matches part of the file name. If you can’t remember file name or part of it you can still search for the targeted file using words that might be found in it. 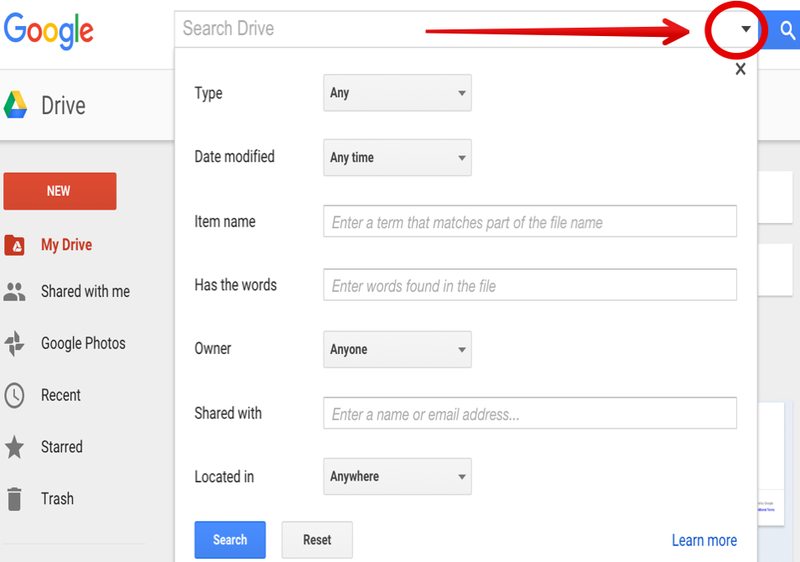 You can filter your Drive search using ownership criteria. In this way, you can search for files owned by you, owned by someone else or by a specific person.